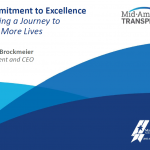 This talk will cover key leadership lessons learned along our Baldrige journey. 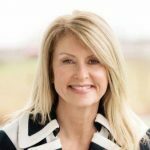 Diane will share how utilizing the Baldrige business model has helped our organization leverage our core competencies to improve. Diane Brockmeier is nationally recognized for implementing several innovative best practices within the field of organ and tissue donation. Among her key accomplishments is the design and construction of a first-in-the-nation, on-site surgical suite for organ recovery. She also championed the establishment of OPO-operated driver’s license bureaus, leading to an increase in state donor registry enrollments. In 2016, Diane was named a recipient of the Most Influential Business Women Award from the St. Louis Business Journal and an inaugural recipient of the Healthcare Accomplishment Recognition Award presented by the St. Louis chapter of the Healthcare Businesswomen’s Association. Diane has been with Mid-America Transplant for 30 years, first as a nurse and then rising through the ranks to oversee all clinical services before becoming President and CEO in 2016. Her passion for donation, combined with her collaborative leadership style, builds consensus and fosters organizational growth and sustainability. The spirit of innovation and a commitment to quality are at the heart of Anheuser-Busch’s history. They continue to be the defining characteristics of our company and people. What was once a local St. Louis brewery is now a global icon of excellence, and while the size of our fermentation tanks has grown over the years, we still honor the age-old tradition of brewing our beer one batch at a time. Come here us discuss our quality processes and how we brew excellent tasting beer in all our breweries throughout the world. Jane has worked in a variety of positions in brewing and product development in the North American Zone of AB InBev She’s worked extensively in the innovation area, where she’s helped develop and launch new brands, including the Shock Top family, Bud Light Lime, Goose Island Seasonals and the Bud Light Lime-a Rita family . Today, as the Global VP of Brewing and Quality, Jane directs technical support and quality standards of the company’s 9 zones around the world. This covers over 300 facilities producing beer, soft drinks, and raw materials. This includes 220 global breweries which produce over 400 brands of beer. 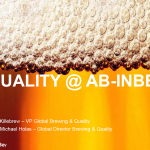 She leads the global taste panel of ABI which monitors the quality and taste of our beers. She has been with AB InBev since: 1985 (31 years). William J. Troy joined ASQ in 2014 following a 38 year U.S. Army career, from which he retired as Lieutenant General (three stars). His most recent position was director of U.S. Army Staff at the Pentagon. Troy served in Europe, the United States, Asia, and the Middle East. 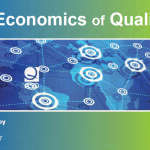 At ASQ, Troy directs the organization’s mission to advance quality and quality tools worldwide. His duties include ensuring the alignment of the strategies and goals established by ASQ’s board of directors. 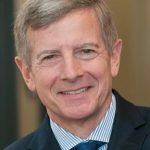 He also works with ASQ’s volunteer member leadersand represents ASQ as a board member of the ANSI ASQ National Accreditation Board, Exemplar Global, and the Baldrige Foundation. Troy was director of the U.S. Army Staff from August 2010 until July 2013. He led 20,000 military staff and civilians, assisted in the oversight of a $5 billion budget, and ensured the integration and coordination of policies, plans, and decisions affecting the entire U.S. Army. He has held many significant general officer positions on behalf of the U.S. military, including Chief of Staff for III Corps in Iraq during Operation Iraqi Freedom. 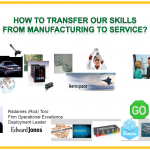 How to transfer your skills from manufacturing to service? This presentation will highlight 10 key principles that a quality, lean or six sigma practitioner can use to ensure their ability to make a meaningful impact for any service company. The problems of seeing a product versus understanding the output and how to rely on tools and techniques in a different way will be presented. Each attendee will be shown ten strong principles to overcome these and many other misconceptions. 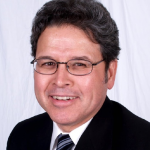 Rod Toro, with Edward Jones, is a Deployment Leader for Strategic Initiatives in the Firm’s Operational Excellence. As part of the original group, Rod led the deployment in the Finance, Client Strategies Group and Legal Compliance Division. He also mentored, trained and coached the original group of team that is deploying in all levels and all divisions across the Firm. Currently, he has been working with the Firm wide strategic initiatives concerning regulations from the Department of Labor, Enterprise Wide Risk Management, FA Selection and Retention, Regional Business Planning and other firm wide projects. He has previously worked in a wide variety of industries (from manufacturing, pharmaceuticals, automotive, aerospace, electronics, medical devices, distribution, consulting etc.). Rod owned his own consulting business for 7 years that helped hundreds of companies in a wide variety of industries install an effective quality management system meeting ISO 9001 and TS 16949 requirements. He has presented in local, regional, national and global conferences (starting in 1992 throughout his career, presenting twice in 2016 at the American Quality Institute ISO 9000 and Lean Six Sigma Conference in Nashville. He has also helped companies become certified to the new ISO 9001:2015 standard. In all these endeavors, 100% of the companies have been certified on their first attempt with no major noncompliances and averaging 3 minor ones per company. Clarence Francis once stated that enthusiasm, initiative, loyalty, and devotion can’t be bought but they can be earned. During this session, attendees will be treated to an introduction of the Lean concepts of waste reduction through value stream thinking and the 6S standardization and organization system. 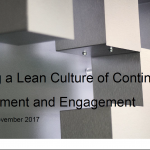 In addition, a method for implementing Lean culture will also be shared. This method will help attendees learn how to earn the engagement of their team and avoid becoming a ‘flavor of the month’ corporate initiative. This presentation will introduce techniques to combine various toolboxes and leverage the experience of participants to identify improvement opportunities for entire value streams and compile project Kanban linked to key business objectives and prioritized based on complexity and return on investment. Kaizen Kanban can be used to describe both the visual facilitation approach to lead flow kaizens and the communication boards that prioritizes projects for entire value streams based on complexity and return on investment. “Kaizen” is commonly used to describe team supported events to quickly break apart and rebuild a process to function better. “Kanban” originates from the Japanese word for signboard or Billboard. They are traditionally implemented to signal to workers what to build next, or what parts to retrieve. The Kaizen Kanban communication and prioritization boards are visible to all levels of employees within the organization. They compile project linked to key business objectives and prioritized based on complexity and return on investment. This tells improvement teams which projects are next in line for implementation. 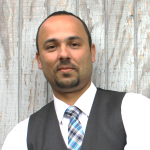 Fabrice Bouchereau, PE, PMP, SSBB, is a licensed Industrial & Systems Engineer, facilitator and trainer. 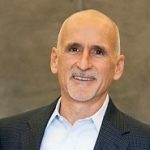 He has over 18 years of experience changing company culture and leading improvement projects in a broad range of industries including healthcare, medical devices, pharmaceuticals, textiles, transportation, oil & gas and energy. Fabrice is an award winning author and accomplished speaker. Fluent in English, French, and Spanish, he has delivered training in the US, Caribbean, Mexico and Latin America. He founded Houston-based ProcessZen Consulting and his mission is to help organizations leverage quality and lean tools to achieve continuous improvement and the mindset to meet today’s innovation, quality and project management challenges. Supply Chain Risk Management (SCRM) is an important part of Managing your Suppliers. SCRM is developing and implementing strategies to document, analyze, measure, and plan to handle your risks. Greg will talk about how he dealt with Supply Chain Risk as a long-time Purchasing Executive at a major manufacturer of metals and small caliber ammunition. In his experience the supply chain needs to be more like supply bungies. Come listen to his real-world experience in dealing with supplier chain risks in one of the most fascinating industries out there. Director of Logistics Sector – St. Louis Regional Chamber. 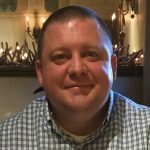 Greg joined the St. Louis Regional Chamber in November 2016 as the Director of the Logistics. He is an UMSL Graduate and has an MBA from St. Louis University. He has spent over 30 years in Supply Chain Management at four large Corporations in the St. Louis Area. As a long time Director of Purchasing, Greg routinely assessed risk in his employers supply chain and developed strategies to mitigate the risks to the greatest extent possible. Clinical decision support (CDS) is the use of information and communication technologies to improve clinical decision making and patient care. While CDS has been widely implemented in many aspects of clinical workflows, such as medication ordering and diagnostic prediction, its use in laboratory test utilization and transfusion decision making has only begun to be fully realized. 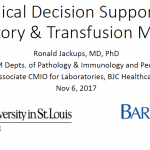 In this session, we will discuss examples of CDS tools currently used by laboratory and transfusion services for different aspects of patient care, including ordering and physician feedback, with a focus on what succeeds, what fails, and why. 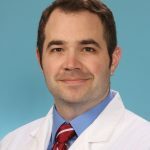 Ronald Jackups Jr. MD, PhD is an Assistant Professor of Pathology & Immunology and Pediatrics at the Washington University School of Medicine in St. Louis. He is also the Associate Chief Medical Information Officer for Laboratories at BJC Healthcare. Dr. Jackups completed his residency in Clinical Pathology and Transfusion Medicine at Washington University. He earned his MD and a PhD in Bioinformatics from the University of Illinois at Chicago. His research interests include clinical decision support and education in laboratory and transfusion medicine. The ISO 9001:2015 standard has 12 specific requirements for performing risk assessment. 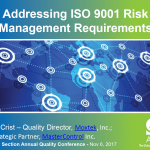 This session will review how a local company has applied risk-based thinking in a variety of ways to address the risk management requirements, including use of a software-based risk tool. 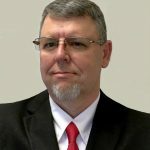 Roger Crist, CQE, CQA, CMQ/OE, CSSBB, and CBA – Director of Quality, Moxtek, Inc.; and Strategic Partner, MasterControl Inc.
Roger Crist has over 25 years of experience as a quality professional covering aerospace, automotive, and FDA-regulated industries. His positions have included working as a quality engineer, quality manager, and quality consultant as well as an assistant professor in the manufacturing program at Weber State University and an ISO 9001 lead auditor for an accredited registrar. Roger is a self-proclaimed “quality nerd” and is currently serving as the Placement and Publicity Chair in his local ASQ section in Salt Lake City. The healthcare sector in the United States is constantly challenged with the growing cost and quality issues that arise due to the difficulties in the identification of complex patient needs. Healthcare providers are focusing on understanding patients’ needs that greatly impact their satisfaction by implementing quality methodologies and tools to manage rising healthcare costs and enhance healthcare service quality as well as patient safety. This session will present the application of the Kano model to identify a diverse range of patient needs and convey its potential usefulness in the continuous improvement of the healthcare sector. Topics will include identification of patient needs, categorization of the needs based on their impact on satisfaction, and prioritization of the needs based on their strength values (category and total) that indicate an important patient perspective. Elizabeth Cudney, Ph.D. is an Associate Professor in the Engineering Management and Systems Engineering Department at Missouri University of Science and Technology. She received her B.S. in Industrial Engineering from North Carolina State University, Master of Engineering in Mechanical Engineering and Master of Business Administration from the University of Hartford, and her doctorate in Engineering Management from the University of Missouri – Rolla. In 2017, Dr. Cudney received the 2017 Yoshio Kondo Academic Research Prize from the International Academy for Quality for sustained performance in exceptional published works. In 2014, Dr. Cudney was elected as an ASEM Fellow. 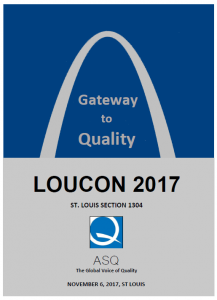 In 2013, Dr. Cudney was elected as an ASQ Fellow. In 2010, Dr. Cudney was inducted into the International Academy for Quality. She received the 2008 ASQ A.V. Feigenbaum Medal and the 2006 SME Outstanding Young Manufacturing Engineering Award. She has published six books and over 65 journal papers. 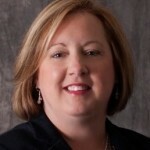 She holds eight ASQ certifications, which include ASQ Certified Quality Engineer, Manager of Quality/Operational Excellence, and Certified Six Sigma Black Belt, amongst others. She is a member of the ASEE, ASEM, ASQ, IISE, and the Japan Quality Engineering Society (JQES). 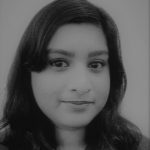 Tejaswi Materla is a Ph.D. candidate in the Department of Engineering Management and Systems Engineering at Missouri University of Science and Technology. She received her B.E. in Electrical and Electronics Engineering from Osmania University, M.S. in Engineering Management and Graduate Certificate in Lean Six Sigma from Missouri University of Science and Technology. Before receiving her Master’s degree, she worked as a Software Engineer in power and software sectors of India. She is an ASEM Certified Associate Engineering Manager and the 2016 recipient of the Herbert McMahon Education Grant by American Society for Quality (ASQ) St. Louis Section 1304. She is a student member of the ASQ, IISE, and ASEM. Ishikawa believed that “As much as 95% of quality related problems in the factory can be solved with seven fundamental quantitative tools.” This tool-set was touted as simplifying the perceived complexity of continuous improvement, thus bringing a quality focus to front-line employees. But much has changed in the last 60 years. Has Ishikawa’s belief held true in modern application? Are companies successfully using these seven tools to solve 95% of their problems? 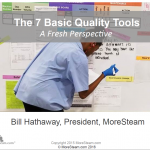 Join Bill Hathaway for an overview of the original Seven Basic Tools of Quality and a discussion regarding their practical application. Are these the tools most frequently used for process improvement projects? See what the data analytics reveal. Considering that these tools were originally selected for a manufacturing environment, are they universally applicable across industries, e.g. service industries? Is this list sufficient to implement and sustain improvement? If not, what’s missing from the list? Remember the last lousy meeting you had to sit thru? Prepare yourself and your team for SUCCESS! Open each meeting and training with energy, organization and laser focus. Keep the team on track and moving forward. 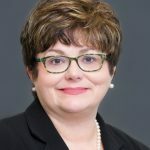 Since 1994 Peg Drummond has lead hundreds and hundreds of meetings from Process Redesign, Strategic Planning Sessions, and Business Plan Rollouts with billions on the table. Her real passion is inspiring leaders and transforming organizations by changing what happens in meetings and on teams. 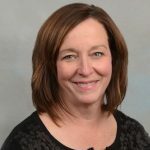 Peg says, “It doesn’t matter how thorough your research and data are, if your team is not motivated to work with YOU – your project will be compromised.” Right out of high school, Peg began learning about the power of teams.